1. We are probably moving, after all. It’s fun to be looking at houses. We’ll stay in the same town, preferably in the same neighborhood. It’s just time for something a little bigger and with a better layout. 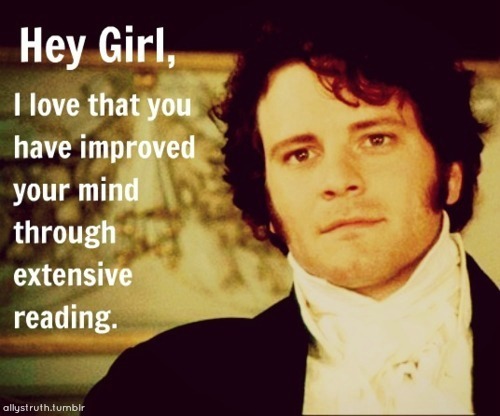 And preferably a view! 3. We want to rent out our current home, instead of selling it right away. Current rents are significantly higher than our mortgage payment, so it makes sense to try it out. But being a landlord is a lot of work, I know, even if your tenants pay. And if they don’t pay it’s a long process to evict. . . .
4. What we’re doing first is refinancing our current mortgage, and drawing out some of the equity to use as part of a down payment on the next house. Because the new loan will be at a lower rate, our monthly payment won’t go up. 5. I cannot tell you how weird it is to be typing this, because we’ve been Dave Ramsey-ish, super debt averse for a long time. Borrowing more money against the house, instead of paying the mortgage off as fast as possible, and then getting a second mortgage–these are all things I wouldn’t even consider 6 months ago. I’m not going into all the reasons we’re ready to take more risks, but we think it’ll be okay. 6. We’ve been watching a lot of HGTV on Netflix (currently–Buying and Selling with the Property Brothers). (I want to play a Property Brothers drinking game sometime–one shot every time someone says “open concept.”) The question is–are we watching HGTV because we’re thinking about moving, or are we thinking about moving because we’re watching HGTV? Hmmm. 7. Because of all the HGTv watching, I think of more and more things we “should” do before selling our house. The thing is, our house is worth about half of the lowest-priced houses you’ll ever see on HGTV. So I wonder how many repairs and improvements would make a difference? And even if we could get buyers willing to pay more, would they be able to get enough of a mortgage? We just got the house appraised and I was surprised at how few details the appraisal took into account. Anyway, if we rent it out we don’t have to worry about that for a while. We’ll just have to figure out what improvements to do before renting it out. Anyone have any moving/buying/selling/renting-out experience to share? Click over to Kelly’s blog for more quick take posts. Happy weekend! Should I Stay [in this house] or Should I Go? and other thoughts at the beginning of the week . . . .
Pat and I frequently find ourselves discussing whether we will ever move. Our mortgage payment is small; so is our house; so is our kitchen. Fed up with tripping over my family and our belongings, I recently searched for acceptable nearby homes that wouldn’t require a higher mortgage. So now we daydream about how to make our little starter home more of a forever home. I watched episode after episode of Property Brothers recently. Our biggest dilemma is what to do with our poorly-placed staircase. Could we move it to the back bedroom? Is that wall to the side of it load-bearing? Or maybe we could extend the kitchen back–merely a matter of, oh, digging new basement stairs. Child’s play. We talk as if money is no object. Of course it is. But I figure we should dream big and then figure out how to work toward it. I don’t want to make cheap, little fixes we’ll regret later. In the mean time, my little one shows signs of pneumonia. I’m taking her to the doctor first thing in the morning. I’ve been reading up on natural remedies for asthma and croup and pneumonia and wishing I had tried them earlier. I did give the girls several grams of Vitamin C a day over the past week. Maybe it helped Girl 1, but it hasn’t been the miracle for Girl 2 I hoped. I’ve had soggy-lunged little girls for six years now and I still feel like I’m groping blindly for ways to avoid the thrice-yearly regimen of amoxicillin and oral steroids. On the bright side, Girl 1 is outgrowing it, so I’m hopeful Girl 2 will also. But my newly-decorated living room wall makes me happy. So does my mantle, despite the roll of duct tape and miscellaneous loitering on it. Have a lovely week y’all. Anne at Modern Mrs. Darcy stirred up a firestorm recently when she called a cardigan “the easiest way to ruin a good outfit.” It was one of her most commented-upon posts of the year. Cardigans! People feel strongly about their cardigans. I have to agree with her for the most part. So many times I think, “What’s wrong here? Can’t I just throw on a cardigan?” And the answer is no (no, no, nope). I returned them both and went without. Fortunately it was a warm evening. 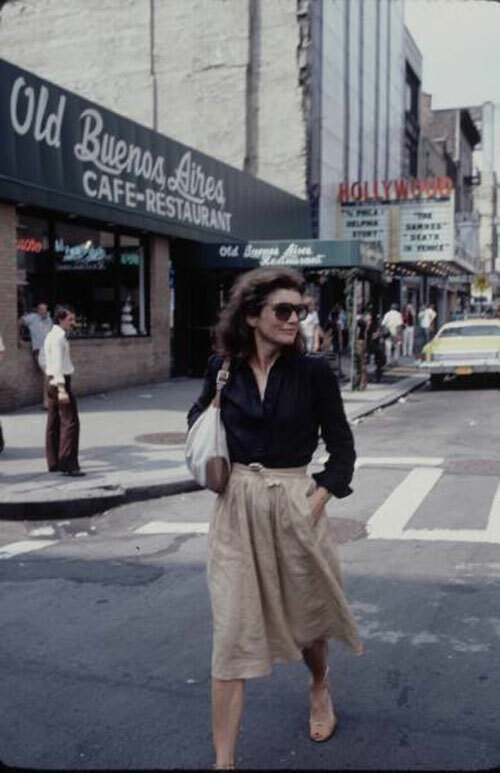 Another example is one night long ago when Pat and I went out for dinner. I have a hard time with dressy-casual outfits. I wore a sleeveless top and jeans. Because it was nighttime and slightly chilly, though, I threw on a cardigan. It killed any potential that outfit had. (I still wore it. Marriage, you know.) In hindsight, maybe it wasn’t so awful, but it wasn’t great. A blazer would have been better. I love my navy blazer. On the other hand, some of my favorite outfits over the past few years included cardigans. It bothers me at this deep deep level that I can’t have a just a few pieces that all go with each other. But a completely mix-and-match wardrobe only seems to work if your pieces are all the same shape. The same cardigan that goes with skinny jeans most likely will not go with flared jeans and an A-line dress, too. I’ve thought and thought about this (chronic overthinker here!) and I’ve concluded: it’s all about proportion. Aesthetics and beauty are all about proportion, right? Symmetry is the most universally accepted standard of beauty. The aesthetics of proportion are unavoidable. Who am I to think I can get away with wearing any old cardigan with anything? Nature and nature’s laws, etc. How that for starting out with cardigans and ending with philosophy? Are you impressed yet? Never mind, I’m going to shop for more blazers. Laura was so kind to ask me to write a little something about homemaking, particularly in the area of keeping things streamlined and low on clutter. You get my drift. My clutter stresses me out. It darkly forebodes of important things lost or forgotten or unaccomplished. 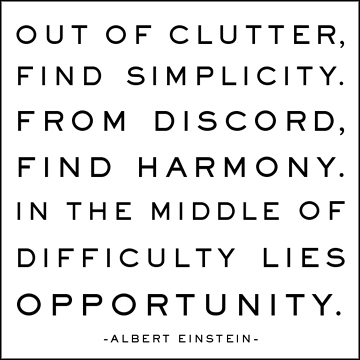 So that’s why I make an effort to keep things tidy and clutter to a minimum. I don’t succeed completely – complete success is a chimera – but any bit of effort bears rewards. So allons-y with some tips. First, believe that a solution exists. This may be hard to swallow if you have lots of kids in a smallish space, or even just one adult in a small place. It’s easy to fall into that trap of “I just need a bigger house” or “If I only had more money…” But don’t give in; you’re a smart cookie, and you can make things better. Second, think creatively for solutions, and realize that the best solutions are practical ones that make keeping clutter down easy. This involves knowing yourself. Do you prefer doing a bit everyday, or are you more of a once a week tidier/cleaner? Will you really hang the coats in the inconvenient closet down the hall, or does it just make sense to put some hooks up near the door? That question leads to the next suggestion. Make a concerted effort to give everything a “place.” Picking up the day’s mess is so much easier if every toy, piece of clothing, dish has somewhere to go. I find that I fold and put away laundry with less reluctance if I know there is room for it in the drawer. The kids do better keeping their rooms tidy (still a work in progress, though) if there is a spot for the blocks, and another for books. As a person who has lived a fairly strict budget for most of my life, I find that I sometimes balk at getting rid of stuff. What if I need it in a few months, and it’s gone?! There are a couple of ways around this issue. The first is to realize that having too much can be the same as not having enough. If you save every pair of shoes for your kids (can you tell that shoes are a thing for me and my four kids? ), even the worn out ones, it can make keeping track of all of the sizes and seasons impossible. All of a sudden it’s winter and your child’s feet have grown a whole size in a few weeks, and you think you have boots that will fit them, but you’re not really sure…. so you buy more boots. Did saving all those shoes really save money? Nope. Another method to use if you have a difficult time letting things go is to put the items aside. Place them in a bag destined for Goodwill and put it in a closet or the basement. And wait. Not only is it super convenient to have a place (see above) for unwanted items right away, this practice lessens the finality of the decision. When the bag is full, review its contents. Odds are you will feel more detached from the items and confident that letting them go is the right call. Keeping the clutter down is an acute and ongoing challenge for most in this age of junk mail and cheap goods. Throw kids and budget restraints into that mix, and things get even more difficult. So don’t beat yourself up. Instead, get excited! With a little elbow grease and some creative thinking, big changes are possible! Mary is a 31-year-old wife, mother, writer, blogger, and personal stylist. Atelier is a lifestyle and fashion blog where she writes about style and wardrobe, movies, makeup, food (and drink), books, life and love. We installed a ballet bar and mirror in Girl 1’s room last weekend. We did it on a whim. I saw the idea on Pinterest, and the very next day I found the perfect mirror at a thrift store. My daughter was thrilled. I was not so. The paint on the bar was uneven. The mirror frame could have used a touch up. We used blocks of wood to hold the mirror in place, and we didn’t bother sanding and painting them. We’re more get-‘er-done types, not so much get-‘er-perfect types. Why can’t I get things to look nice? And then my brother visited and took a few snapshots. Maybe I need to focus less on how I think things look. And more on how I see them. What can an American, middle-class, young-ish mom living in Small Town, U.S.A learn from an aristocratic, middle-aged French lady living in Paris? Just about everything, apparently. Read all about it on at Mary Boctor’s blog, Atelier, where I am guest posting today . . . and she’s invited me to come back every month! Squee! Readers, I am on fire. I found this book at the library. My theory is that having little kids is the functional equivalent of having ADD. And if you’re like me and already had a somewhat short attention span even before having kids . . . well. You know. The basic gist of the book is to work around a short attention span, instead of trying to change it. If a family member always drops his coat on the floor by the door, don’t make yourself miserable trying to get him to walk down the hall, open the coat closet, and hang his coat on a hanger. It’s never going to happen. Just hang a hook on the wall next to the door. And if he doesn’t use the hook, stick a basket on the floor. Then when he drops the coat at least it will land in the basket. It’s never going to happen. At least not for me. And not for most people I know who have little kids. Before, the corkscrew was in one drawer sometimes, the other utensil drawer other times. Now, it has its own 3M hook, right next to the wine glasses. It’s the little things, folks. Are you impressed by all that open space? Mainly, it’s because lots of towels were in the wash. But, you see this little shelf on the door? In all the five years we’ve owned it, our poor heating pad never has had a home. Sometimes it was in one of our bedside table drawers, sometimes in the other. Mostly it was on the floor somewhere collecting dust bunnies. Now it has a place to call home. Before, when I needed a screwdriver or tape measure, I had to unstack my little tool kit from where it was wedged in with some other bins in the linen closet. I think I procrastinated on projects, subconsciously, because getting tools out was such a hassle. Now, my tools are easily accessible in an open lidded bin. I amaze myself sometimes, really I do. And for my daughter with an extremely limited attention span, who is in a big artistic phase at the moment: an open-topped bin for crayons and markers. It wasn’t until after I read Jen’s post, Amelia’s post, and this book that this occurred to me. 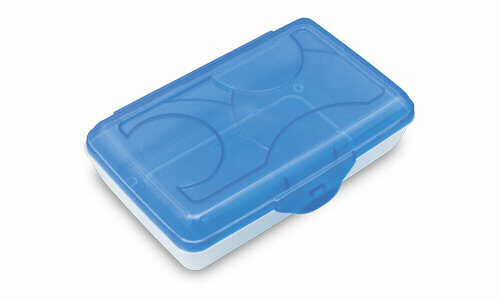 Before, we used one of those little pencil cases with attached, snap-on lids for her crayons and markers. Getting her to clean up her art supplies was like pulling teeth. Now, she just drops her markers in a bin. We still have to coax and remind her, but clean-up is much easier now. Finally, I bought bins for Girl 1’s ballet and soccer stuff (top shelf) and shoes (bottom shelf). Little Sister probably still will pull everything off the shelf, but at least now everything has a home where Girl 1 easily can put them away. Also, I put a hamper in her room. The main hamper is only three steps from her bedroom door, but those three steps were enough to distract her from getting dressed. I am really, inordinately excited about all of this. I’ll stop now before I embarrass myself. Thank you, Jessica for hosting What We’re Reading Wednesday and Hallie for hosting Five Favorites this week! A blog post . . . about kitchen organization?? Whoooooooah. I love our house, but it has a teeny tiny kitchen. In my mind’s eye, I see the architect of our 1960s house as an Archie Bunker type who never set foot in the kitchen yet never consulted his wife on how he should design a kitchen! Ours is a long way from perfect, but it’s also a lot more workable than it used to be. For today’s Five Favorites I share some very non-glamorous things that have helped make our small kitchen more usable. Aaand, because most of my inspiration came from one book, I’m also linking up with Jessica at Housewifespice for What We’re Reading Wednesday. I read the book awhile ago, but I checked it out from the library again and have been re-reading it. 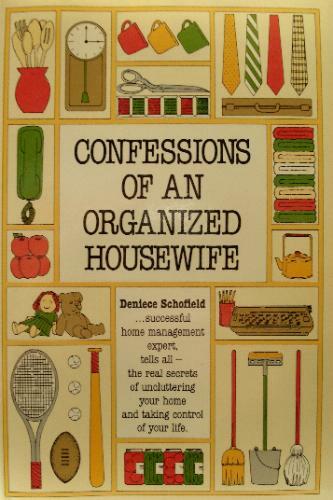 The title is a little, um, quaint: Confessions of an Organized Housewife: The Secrets of Uncluttering Your Home and Taking Control of Your Life, by Deniece Schofield. I’ve read a lot of household organization books and this is my favorite. * Her suggestions are pragmatic and non-perfectionist. She describes tasks that are well beyond what I can do at this point with two littles underfoot (ironing! hah!) but I still find the book more encouraging than discouraging. The most important takeaway for me from Ms. Schofield’s book is the idea of arranging things in a way that is convenient to where and how often you use them. If you use something every day, you should be able to get it with one motion. If you use it less often, two or more motions is okay. Before, I focused on fitting in as much stuff as possible. Now, I’ve focused on the items I actually use and making them as convenient as possible. Things I rarely use I store in less accessible places. And I’ve gotten rid of a lot of stuff upon realizing that I just wasn’t using them. For instance, I use one or more of my glass mixing/serving bowls every day. I used to stack them all together along with some Corningware, up high over the sink. Every time I needed one I had to take them all down and unstack them to fish out the one I wanted. Bad idea. Now I have them all mostly unstacked and I can reach any one of them with minimal shifting and moving of other items. It’s not as efficient a use of space, but it’s a much more efficient use of time, which is more important. To free up space, I’ve stored baking supplies in a hard-to-reach cabinet over the fridge, because I’m not baking much these days. Also, Ms. Schofield wrote her book before organization became a sort of fetish and the market for cute, expensive organization tools became a big thing. So her solutions are simple and cheap. For example, she’s really into simple, open bins (like this) for organizing anything and everything. And this solution just happens to be recommended by my other favorite household organization guide. Speaking of simple plastic bins, that’s what I use underneath my kitchen sink. Not everything fits, but almost everything does. And when push came to shove, I was able to grab the fire extinguisher quickly when I needed it. That’s organizational success in my book! I used to have all my pots and pans stacked together in a cabinet. Now I have them hanging up and can reach one easily. What I use is actually a tool and shovel rack from Lowe’s. This was the best way I found to keep my tall husband from hitting his head! I love this little pull down spice rack. It doesn’t fit in my spice cabinet, but I use it for storing medicines and vitamins in a cabinet that is above my head. Finally, I really, really love this cookbook holder my brother gave me. It folds up under the cabinet, so it doesn’t take up any counter space. Plus it is made by hand in the U.S.A. Win! I can’t find the exact model for sale any more, but this is very similar. Thank you, Jessica for hosting What We’re Reading Wednesday and Grace for hosting Five Favorites this week! * P.S. Since I wrote this post, I started reading Organizing Solutions for People with ADHD. Amazing. Possibly my new favorite. More on that later. 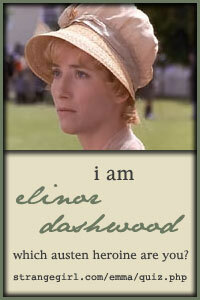 But I still really like Ms. Schofield’s book.
. . . kinda sorta, right? 1. Having a uniform really really works: 6 tops, 2 skorts, 1 pair of shorts, sandals, Top Siders, and necklaces. I only have to think about 15 seconds in the morning about what I’m going to wear. Every top goes with every bottom, so as long as I have one of each that’s clean, I’m good to go. 2. Minimalism: I own fewer clothes than ever before in my adult life and I’m happier than ever with what I wear. It feels so right. For now, I’m happy with what I have. 1. The sandals, oh the sandals. They really put the “Mom” in “Mom Uniform.” I procrastinated finishing this post for multiple reasons, one of which being the absurdity of publishing something purportedly about “style” that contains pictures of these shoes. The Gizeh even has the Ain’t No Mom Jean stamp of approval. 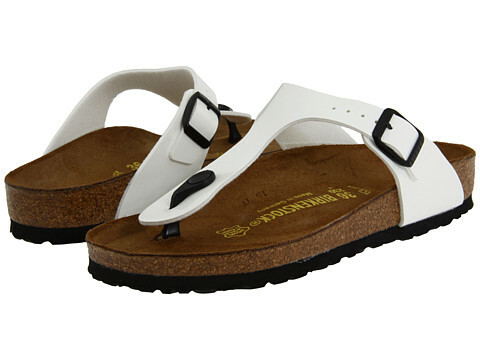 But it doesn’t come with Birkenstock’s soft footbed (only the original Birkenstock footbed). I tried on the soft footbed and my feet, knees and back outvoted my eyes and sense of aesthetics 5 to 3. There was no debate. They do feel wonderful, but now I’m stuck with a very expensive pair of ugly sandals with no resale value and the lifespan of a tortoise. I suppose I could buy a better looking-though-less-comfortable pair of sandals to wear out and keep the ugly Birks for being on my feel around the house all day. I’m aiming toward minimalism, though. And I can’t stand the really flat, no-support type sandals for even a second. make my legs ache. We’ll see. I started out my quest inspired by Crystal’s super-simple, plain-but-pretty, minimalist wardrobe. I wanted to have a set of outfits that I could throw on in the morning without too much thought, wear at home with the kids and yet be able to wear in public without shame. And I think I’m there. So long as no one looks at my feet. Linking up with Andrea and Ellen for their Real Mom Style link-up. Thanks ladies!